Stéphane Moscato aka STF has been archiving the living memory of the city of Marseille for ten years. Peeling off layers and years of illegal posters, he uses the typography and patterns he finds on them as a guide. This 'rip it up and start again' punk rock culture enthusiast first applies the stencil back to front by pressing, then uses black paint to draw the outlines of the design. Giving a modern touch to the approach of Villeglé, Stéphane calls attention to his obsession with the human body, each time telling a different story with a different mythology and an ambiguous interpretation of his work. 10am - 6pm daily or by appointment. The exhibition will be open Wednesdays to Saturdays from 13:00 – 19:00 or by appointment. Guided tours will be held daily at 17:00 and private tours may be organized on request. Bundling up a slew of street art cliches “Best of the Worst” sees the poor man’s Banksy ditching gallery assistance and exhibiting all new work in an abandoned bank on the Lower East Side. 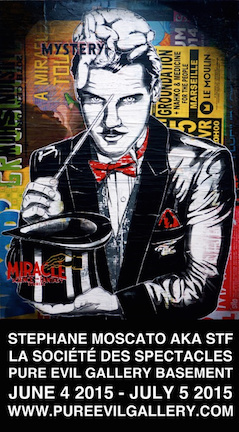 Similar to his 2014 abandoned building takeover entitled “Surplus Candy,” the space will be completely transformed with unique installations and a large number of hand-painted pieces on reclaimed Brooklyn wood. In addition to a new series of Hanksy originals, “Best of the Worst” will house a notable group show cashing in on local and national urban artists (featuring over 20 up-in-coming blue chip art stars of tomorrow). All work will live alongside your favorite 90’s arcade games and TMNT/Foot Clan inspired skate ramps since, we all know, no one actually goes to art openings for the art. 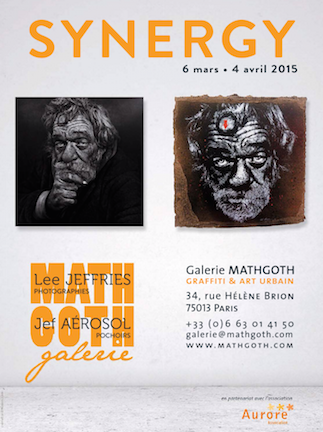 From March 6th to April 4th 2015, Matgoth gallery is welcoming stencil artist Jef Aérosol and photographer Lee Jeffries. The two talented artists have joined hands to produce the duo show : SYNERGY. Since the very first time Jef Aérosol stumbled across Lee Jeffries' works, he's been fascinated by the portraits of homeless people that the British photographer magnifies and brings into the light. Jef immediately saw that they could lend themselves to a stencil rendition and he could revisit in his own style those wearied faces, pregnant with meaning. In early 2014, he got in touch with Lee and they met up a few weeks later in London. They got on well with each other at once and decided on the spot about a duo show. 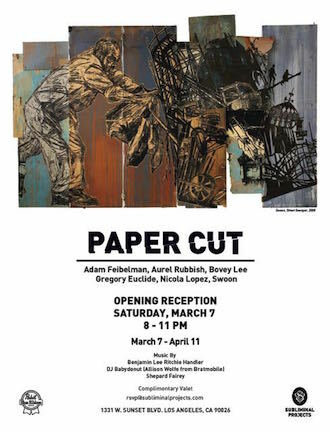 PERSONS OF INTEREST Opens Project M/7 for Urban Nation (UN) in Berlin with 12 Brooklyn Artists on March 14, 2015, curated by Steven P. Harrington and Jaime Rojo. Urban Nation (UN) and Brooklyn Street Art (BSA) bring Brooklyn to Berlin with PERSONS OF INTEREST, a stunning portraiture show for Project M/7. 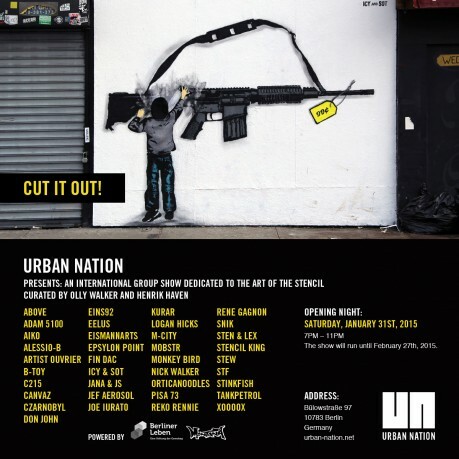 New original artworks by a diverse collection of 12 important Brooklyn Street Artists will appear on the façade and in the windows of the future Urban Nation ‘Haus’. BSA and UN invite guests to a reception and a show with new works directly on the walls at the UN Pop Up Space. The show will open at 7-22 pm (in Bülowstrasse 97) with a reception where guests will have the opportunity to meet the curators and artists in person. Democracia real ya!’, meaning ‘real democracy now!’, is an exciting exhibition of street art by Rosario Martínez Llaguno and Roberto Vega Jiménez, members of the Mexican art collective Lapiztola Stencil, based in Oaxaca. This collective was formed following teachers’ strikes in Oaxaca in 2006 which were violently suppressed by the state. Street art became a form of political protest, highlighting the range of issues which Mexicans face, and providing hope and inspiration. The exhibition will celebrate the fight for social justice that the artists are involved with in Oaxaca and Mexico as a whole. The Lepinards became interested in displaying the work after reading a Chronicle report on the efforts of Brian Greif, former general manager of the defunct KRON-TV, who in 2010 persuaded the owner of the vandalized Red Victorian Bed and Breakfast to let him remove 10 redwood siding planks on which the rat was painted. Greif took the painting to art-restoration specialists, who mounted the slats on corrugated aluminum. 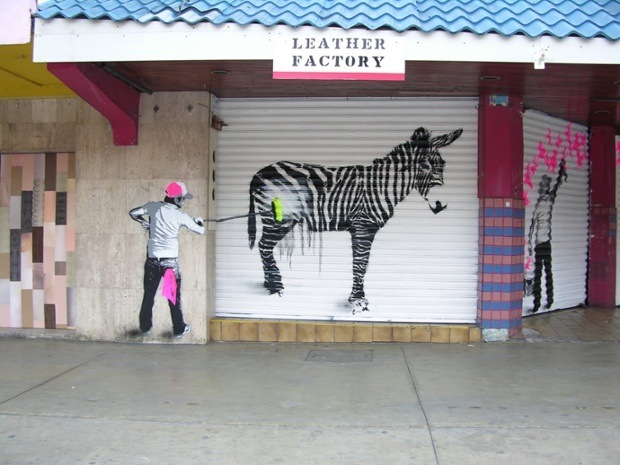 He raised $10,000 to offset costs through a Kickstarter campaign, promising never to sell the work, even though other Banksy creations have sold at auction for more than $1 million. Greif then tried to donate “Haight Street Rat” to various museums, but without a letter of authentication from the artist, the institutions said they would not accept the work. ** After spending 2 months immersed in Detroit culture Above was inspired to create a special screen print that we are giving away to the first 20 people that attend the exhibition. Opening to the public Friday, November 21st from 7-10pm, Inner State Gallery is proud to welcome London-based street artist Above. Created over a 2 month residency at Inner State Gallery’s expansive studio in Detroit, Remix is an entirely new body of work from the internationally recognized public art advocate. The exhibition introduces a brand new body of work highlighting Above’s iconic arrow that has appeared prominently in a massive public art campaign spanning 15+ year, 100+ cities and 60+ different countries across the globe. Attacking the exhibition like a deejay produces a live set, Above has meticulously dissected and reassembled his latest collection of arrow and targets by creating multiple color palettes and weaving them together to create new seamless works.